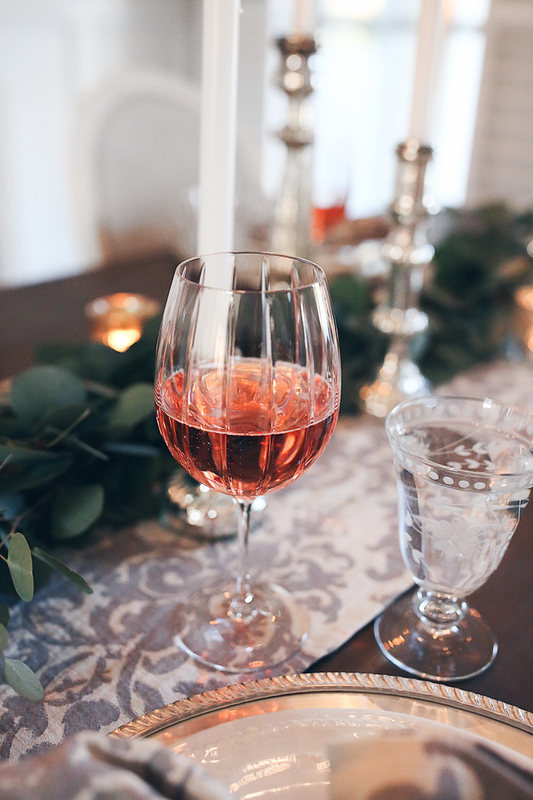 Our Thanksgiving Tablescape + HOME Giveaway!! On to the table! I am LOVING mercury glass right now so I knew I wanted that to be the theme of the table, with lots and lots of Mercury glass candle holders. I found a silver and white table runner and matching napkins, and they look so good paired with these antique silver chargers and the white dinner and salad plates. The table still looked a little plain, so the finishing touch was this silver dollar Eucalyptus garland to add some greenery. I arranged the candlesticks around the garland so that it weaves in and out of the candles. I even added a few tea lights for a more romantic feel. I love how it turned out!! 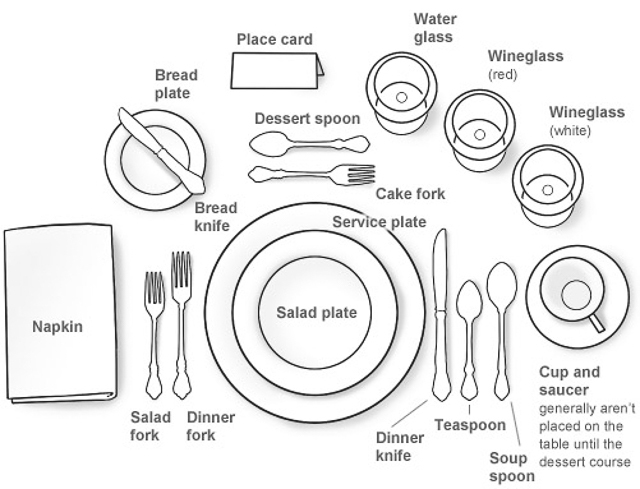 If anyone needs a refresher on how to set a formal table, I found this really good diagram on Pinterest! and that’s it! Check back tomorrow for the winner of the giveaway AND another giveaway!! I began following you Pinterest a few months ago as fashion inspiration, and quickly became an avid reader of your blog! Your hair is my goal for my next salon visit! 🙂 your home is looking so awesome! Loved this post and awesome giveaway ! On a side note, (that I hope you don't find weird haha) my friend is moving to Charlotte the day after thanksgiving, when I'm down we should connect! I hope you like my pins! Love this table! Eucalyptus is one of my favorites! Ever so stunning, Caitlin. It is such a beautiful setting! Love the dining room setup! Looks gorgeous! You're so sweet doing all these giveaways!! 🙂 I love your style! Love grey and white, classic and clean! We are currently renovating a house and can't wait to use your blog posts as inspiration for decorating!!! You have such a beautiful home. I love the tablescape! Such a gorgeous dining room! 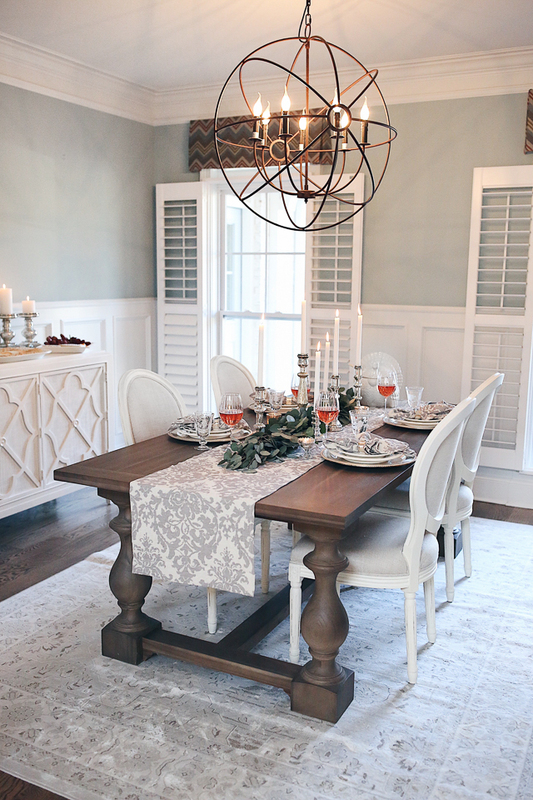 A little too traditional a table scape for my tastes, loved the pendant lamp -wavy faux flame bulbs not so much…..and don't get the fabric window valances …kinda grandma-ish. Cant wait to see how new digs mature art, 6 decor wise – although think it leans more traditional than I'm inclined…hope you quirk it up some …like the formal setting diagram…way too laid back to use it …but like observing how its done…Enjoy your turkey day holiday! 🤞 would be so perfect since my goldendoodle just chewed my wool and jute rug from pottery barn 😬😭! What a beautiful table scape! The eucalyptus garland with the candles looks absolutely amazing. As I get older, Thanksgiving has become my favorite holiday– just good food, family, and friends- and when it's over, you still have christmas to look forward to!! Can’t wait to see what you have in store for Christmas in your new house this year!!! LOVE! Your new house is so lovely, can't wait to see it all dolled up for the holidays! I just love your style! Did you major in fashion/ and or interior design? Your house, outfits, and hair are always amazing! Thanks for doing the giveaways! Love the tablescape especially the garland! Looks festive and fresh! This is SO well timed, my fiance and I have a home inspection today on a house we have an accepted offer on! I'm so hopeful everything goes well so we can have a home together and decorate!! I can't BELIEVE that rug came from The HD! Definitely pinning that one for later, too! I love the eucalyptus garland touch as well, I was thinking of a similar garland for the head table at our wedding! I hope you, Chris, and Winnie have a very happy Thanksgiving!! Love the tablescape! It looks so fresh and festive!!! Building a new house right now and I definitely use your blog as inspiration! Loving your dining room decor. You are my favorite blogger to follow(: Thanks for the giveaway! Your table is so inviting! 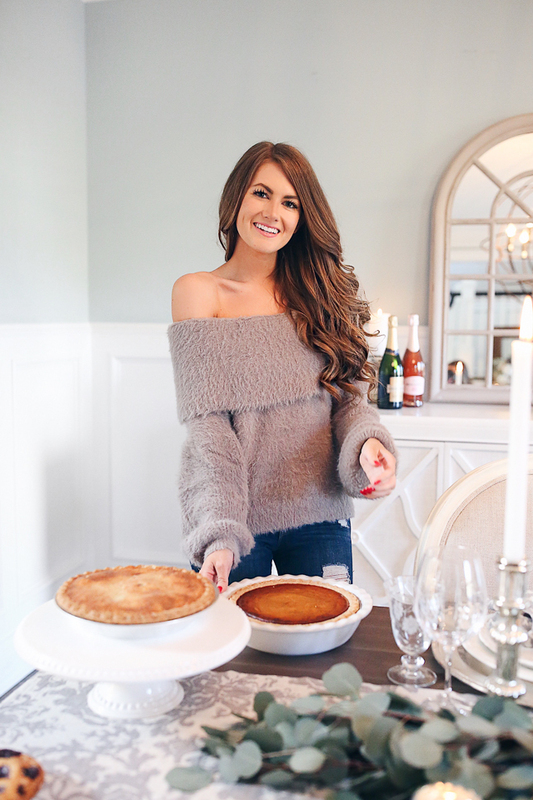 Congratulations on the new house and celebrating Thanksgiving with both of your families 🙂 I've followed you on Pinterest for some time now, and love seeing all of your outfit inspirations. I check it probably every other day when I'm getting dressed in the morning lol! I am building a new house and definitely use your blog as inspiration! Looks great! I check your Pinterest boards several times a week for outfit inspirations! Your table is lovely, have a wonderful Thanksgiving! such a pretty and classic color combination for the holidays! such a pretty and classic color combination for the holidays!! Love the greenery on the table, beautiful! Love this! I cannot wait to buy a home and have the space to decorate it like you! Your table looks beautiful! Can’t wait to see your dining room redone! Here’s my Pinterest link! 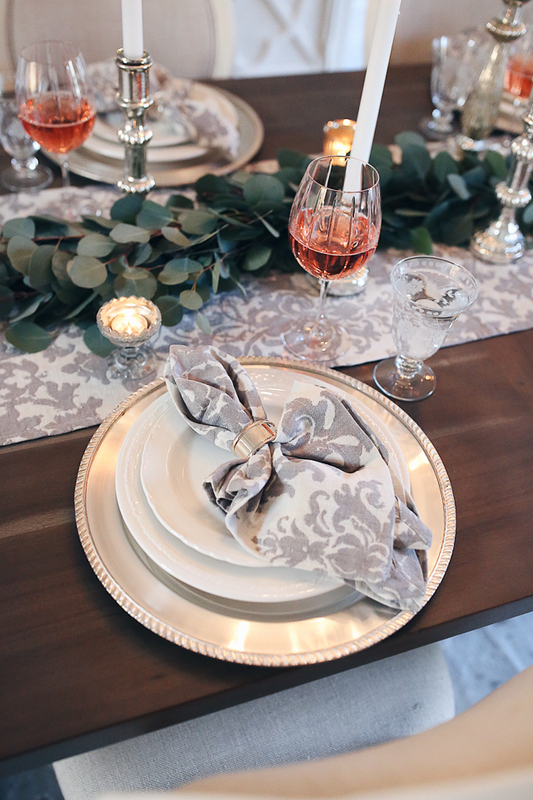 Such a beautiful place setting! Really love the Thanksgiving tablescape! https://www.pinterest.com/mckinleyhaskin/fashion/ love SO many of your looks! And my name is Lauren Murray! I've followed you for awhile and love your posts. Table looks gorgeous! Happy Thanksgiving! Here's my Pinterest Board called "outfit inspiration"
So simple yet looks great! Could definitely tweak this same tables cape for Christmas! I've followed your blog for awhile and I always love your posts. Gorgeous table! Excited about the giveaways this week! Love your rug! I may have to look into that one. I've been needing a new rug for a while. Loving how you set the table! https://pin.it/sysvfxizqm5pqv Can’t believe i didn’t follow you on Pinterest sooner!! Definitely pinned more then 3 pins too because I want your whole wardrobe! Hi there! I just love reading your blog! Love your style! I had to get a new pinterest account, so thank you for this post so I can follow you again!! We just bought a new house as well, so a PB gift card would help us so much!! Thank you so much for thinking of your followers this week! We all appreciate it and love following along with your life. Happy Thanksgiving to you and Chris! Definitely using this as inspiration for my Thanksgiving table! Excited to see the new paint color! Hi Caitlin! I have followed you on Pinterest and all social media accounts! Would be very grateful to win this!!! I love the white shirt/green jeans outfit – I noticed the shirt is sold out but I found a very similar one at Anthropologie that your readers would love! Can you please let me know what color is on your walls in this photo?! I love it! Your giveaways are the best!! Love your new home. I'll hope you'll show us your journey of decorating it! We just bought a house too and its so much fun (and stress) filling it! I look to you for some inspiration. We have the same color walls! Love your new home. I hope you'll show us your decorating journey! You are seriously an inspiration for all things beauty and lifestlye! Hi! My Pinterest is Pinterest.com/chelsealierly �� your tablescape is so gorgeous! I think it's so cool that you are doing this! You have been one of my favorite bloggers for years. I hope you have a great Thanksgiving! Beautiful table! We are working on a new house right now too. I would love to see how you repainted! Have a blessed Thanksgiving. That kitchen table and decor is gorgeous. It fits your new space perfectly. Beautiful outfits always! Beautiful decor as well. Gorgeous tablescape! I absolutely LOVE the chandelier! http://trendkeeper.me .. aster&black sneak peek and GIVEAWAY! My husband and I recently inherited an old house. It is beautiful but definitly needs updated. You make decorating look so easy whereas I stared at thousands of rugs for weeks before I finally picked one. I have been following you for a couple years now and love your style. I also love that you have been including home sruff in your blog now too. I've been pinning you for years! Awesome giveaway. Happy Thanksgiving! I love reading your blog every morning with coffee before I get my day started. I'm loving all the home posts, they're so inspiring. Love your Thanksgiving decor! And that rug is gorgeous! Love this idea of doing a giveaway each day this week! Your dining room looks gorgeous! Happy Thanksgiving! Your home is gorgeous!! I’ll definitely be using your blog as inspiration for my new home! Your boards are amazing! Thanks for the opportunity! https://pin.it/lhnz4wg6dcrrfy (Maria Muscarello) I think I re-pinned correctly. Super new to Pinterest. 🙂 Thank you! Love the idea of the room without curtains. Thanks so much for doing this give-away, especially with the holidays upon us! Here is my Pinterest board: https://pin.it/teotgip5n56jay. You’ll find the pins on the “fashion” board. Love your work! Hope you and your family have a wonderful holiday!! So beautiful! That light fixture is unbelievable!! I would love to win this stuff!!! I love your blog! I get so many wonderful fashion, beauty, and home ideas from you! i was already following you on Pinterest 🙂 these last few posts are making me sooo excited for the holidays!!! 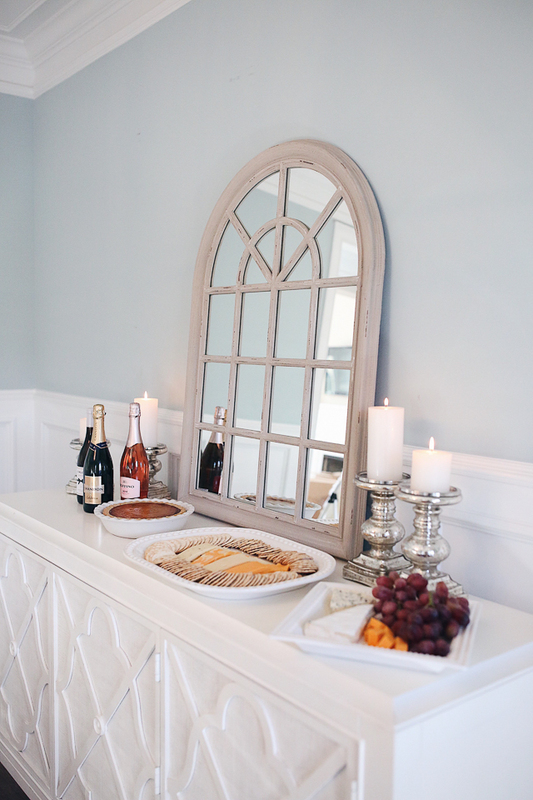 im obsessed with your holiday bar cart! Love the eucalyptus! Here’s my Pinterest link: https://www.pinterest.com/chandlarmontano/. Your dining room looks beautiful! Your table is gorgeous!! I love the neutral colors in it! 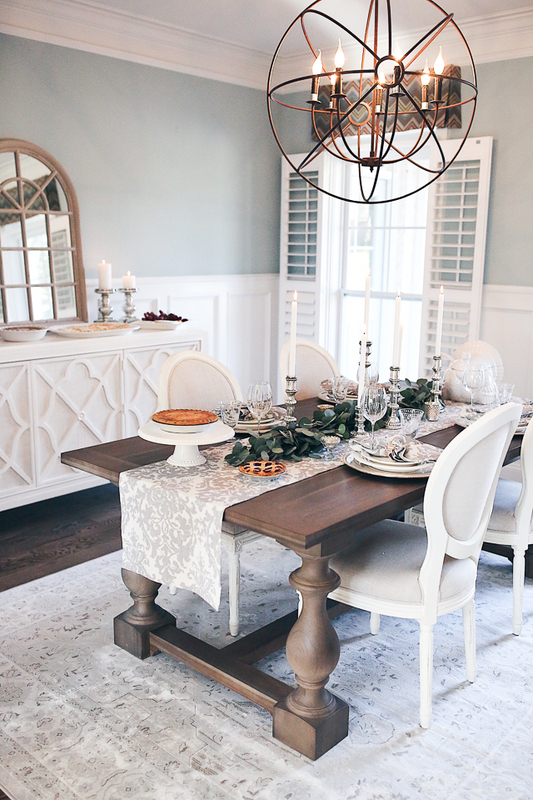 Hi Caitlin, I’m loving your formal dining room for thanksgiving! Those wine glasses are gorgeous! Also the tea lights add a nice touch. http://www.pinterest.com/chula2007 love your home!$ it’s beautiful!!! Thanksgiving is my favorite Holiday! The food, decor, family, beginning of CHRISTMAS!!!! I love this blog and all the ideas that you bring to my mind and your inspiration! You are truly amazing at what you do!!! Your Pinterest is one of my favorites for fashion and home inspiration! I just love the knotted red sweater. Done! Such a sweet idea to do these holiday give aways. Tis the season! Love your style! I’ve been following you forever now! I love everything about your Thanksgiving set up, so pretty! You have such great style. I just found your blog/instagram and I LOVE all of your outfits and interior decorating!!! I love everything!!! Pinned my top 3 in "my style board"
I love your style! I’ve been following you forever now! Would love to see more home/decorating posts! Such a sweet idea to do these give aways! ‘‘Tis the season— xoxo! Obsessed with your Pinterest!!! Always have been, always will! Your house looks beautiful!! Love that rug! So glad to know you have a Pinterest!!! I had no idea! Gorgeous dining room! #goals Happy Thanksgiving!! Moving soon this would be SO great! https://www.pinterest.com/lilywallace103/fashion/ here is my link:) love that chandelier!! Such a beautiful home! Happy thanksgiving! Love your blog & your insta account! It's given me a ton of inspiration! Keep up the great work 🙂 and have a great Thanksgiving! I love your blog and insta page! It's given me a ton of inspiration! Keep up the great work 🙂 and happy thanksgiving! Yay I love that robe!!! Love how you're decorating your home!! https://pin.it/l5ez3exegp6kle I’ve attached the link to my Pinterest board:) I absolutely adore your outfits! Now with fall and winter in our midst, I love all your cozy but still chic looks! Especially the scarves…so pretty!! SO beautiful! Your home is lovely!! I love all your outfits and have been following on Pinterest for sometime now! Hey Caitlin! I just started reading your blog a few months ago and have not regretted it! Your Thanksgiving decor is absolutely EVERYTHING. I love the mercury glass theme! It's my favorite right now 🙂 The rug is absolutely beautiful! I love following your blog for all of the wonderful ideas and outfits you put together! Ive been eyeing that robe forever! Just wanted to say how much I’ve loved following you! I’ve always kind of wanted to start a blog of my own and it’s been so awesome to watch yours grow the way it did! Congrats on your engagement (sorry I’m a bit late) and happy thanksgiving! That’s a beautiful tablescape. Much nicer then mine will look!😂😂 your blog is amazing. Been following along, since the Nordstrom Anniversary sale of 2015. Have a happy thanksgiving! Love your blog so much. You have great style, I pinned 3 of your outfits. I like how you always blog a bit of everything! It's a great time when I read your blog every day and look through your tips and tricks or holiday recipes or gorgeous outfits!! What a fun giveaway! 🙂 Here’s my Pinterest board! I just love your home decor! Having just bought a house myself, I love these posts for inspiration. Just wanted so say how much I’ve loved following your Pinterest and blog site! I love your fashion sense, decor posts, and your book reviews! I’ve always kind of wanted to start my own blog so it’s been really awesome and inspiring to watch your grow the way it did! Congrats on getting engaged (sorry late response lol) and Happy Thanksgiving! I entered the drawing and pinned extra outfits just to be safe. Thank you for doing these awesome giveaways! what a beautiful dining room! Your dining room is absolutely amazing. Hope y'all have a happy Thanksgiving! Such a pretty table! I'm in the middle of planning, cooking, and setting a table for my Thanksgiving tomorrow night…..and the guest count has somehow gotten up to 26!!! Yikes ha. Love your runner here, and I'm planning on doing something similar with the greenery! Hope you have a great Thanksgiving! Love love love literally everything about you! I hope to one day have clothes like you have and I love your table for thanksgiving. I’m just trying to make it through college but look forward to seeing your insta posts everyday. Also love all the give always! https://pin.it/ehkqhmkvixrrvi Love everything on your blog! Can't imagine your dining room being any prettier, so looking forward to seeing the remodel! Can't imagine your dining room looking any prettier, so looking forward to seeing the remodel! Love the colors you use in your house! I am obsessed with neutrals! I see that you are a UNC alum! 8 am a huge Tar Heel. My great grandpa played fo UNC and was nicknamed the Battering Ram and that is why our mascot is the ram! I love following your page, you have the cutest outfits and style tips! I was actually in Aspen in October and noticed you were there too! I got engaged so winning this giveaway would be a great celebration gift!! I am definitely obsessed with your style! I am definitely obsessed with your style!! LOVE the holiday posts and your new home is gorgeous!! It was super hard to pin just three outfits that I loved, so I pinned a bunch! You have a beautiful blog and are a great source of fashion and home inspiration… Good job! Love your blog & style! Follow you on Instagram for inspo! Love the eucalyptus garland – I've been on the hunt for a eucalyptus wreath, I just love the way they look! Omg I am totally loving your tablescape! Love your outfits!!! Fall fashion on point! I look forward to your blog everyday! Happy Thanksgiving! Check my Board out on Pinterest! It was super hard to pin just three outfits that I loved, so I pinned a bunch! You have a beautiful blog with great fashion and home inspiration… Good job! I’ve always enjoyed your blog and style! I hope you enjoy hosting Thanksgiving in your new home! I have been following you on Pinterest for so long now! You’re one of the bloggers that inspired me to start my own fashion blog!!! Just love your style! Thank you for hosting these great giveaways! https://www.pinterest.com/rickihemstreet/ Here’s my pinterest! I can’t believe i didn’t think to follow you here in the past. It’s going to make saving your outfits so easy! this one is perfect because i already follow you & pin your outfits! https://pin.it/rp7unmbsivf3nq Love your style. Would be so grateful to win this style! Here’s the link to my Pinterest, I’m a huge fan! I found you on Pinterest and love seeing all the outfit ideas and home inspiration. I just finished redecorating my home and I love watching your beautiful new house be transformed! I am obsessed with your style! Gives me so many ideas for my outfits! Forever taking inspiration for my home from yours! Also – love the mirror over your sideboard! Love your home decor! Happy Thanksgiving! Your home is absolutely gorgeous. So in love with your dining room table for Thanksgiving!! Some tables seem so overwhelming and cluttered but this is so tasteful & elegant! So obsessed with your tablescape! The barefoot dreams robe was already on my Christmas wish list so this giveaway is perfect! Already had basically all your pins re-pinned! (: Thank you for this fabulous giveaway! I am so in love with your table for Thanksgiving. So gorgeous! I have been following you for a while, and I love your blog! Your outfits are always so stylish. Hope you and your family have a great Thanksgiving! I already had basically all of your pins re-pinned! (: Thank you for this fabulous giveaway! Such good home ideas, I am LOVING these posts…I enjoy that you provide a variety of topics along with your fashion! Here's my board I pinned them to:https://www.pinterest.com/emeliaannelawrence/f-a-s-h-i-o-n-s-p-i-r-a-t-i-o-n/ Have a Happy Thanksgiving, xo! The pins are on my "me" board 🙂 Love your style and your fashion inspiration!! The pins are on my "me" board. Thank you for the inspiration!! love the table and rug! I am loving the way your dining room looks! It’s so warm and inviting. You’re such an incredible decorator! love the table and the rug! Love everything you post from fashion to home decor to beauty!!! Love the eucalyptus leaves! Such a gorgeous centerpiece! Here is the link to my Pinterest board! I’ve been pinning you for a while now! Love following you on other socials too! I like your fashion style. Simple yet elegant. The bags, boots, scarfs, sweaters and torn jeans look perfect on you. I pinned 3 of my favorite outfits. I have actually been following you on pinterest for quite some time now! I love your outfits and use them for inspiration and also buy some of your pieces! MY pinterest is https://www.pinterest.com/kaylliecooper and I pin your stuff to my "Clothes" board! LOVE your place setting!!! I will be repinning your outfits tonight once I'm home! Yaaaas girl, loving the Thanksgiving table! So much inspo. Everything looks Beautiful! Happy Thanksgiving ! Love your tablescape! That rug is gorgeous! Obsessed with your new house and decor! I am loving all of your home decor pictures!! Everything is stunning congrats!! After your blog posts on this years Nordstrom sale, I have been obsessed with voluspa candles. Thanks for sharing! Happy Thanksgiving! 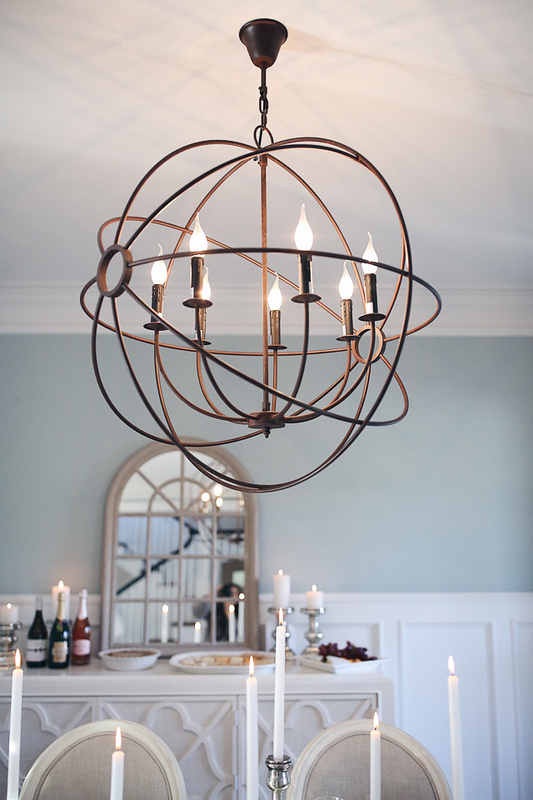 Love your chandelier in the dining room! Ahhh!!! This is SO beautiful, Caitlin! I love eucalyptus, but TJ's was sold out when I went to pick up some flowers. Yes, I saw the tweets! Your followers have such great ideas. Girl, I pin you ALL the time on my Style File: Bloggers board! See if you can find yourself, hehe! I think you get the most repins I've seen on my Pinterest newsfeed. You're everywhere, haha! I'll keep thinking of giveaway ideas and will tweet you! Sidenote, your new floors and paint look AMAZING! Everything in your new house is coming together so well! Happy early Thanksgiving! Love the table set up for Thanksgiving! Here is my Pinterest and re-pinned 3 of your outfits! Your home is #goals just like your fashion! I follow your Pinterest as kayleyfc. Your table is absolutely gorgeous! Such a fun and thoughtful giveaway! Sorry for going a bit overboard! In love with your style and your put together outfits!! Love following along with your blog! Loving all of your looks and style. Great inspiration going into the holiday season! Love the place setting! Check this Board out on Pinterest! loce It! I pinned 3! Hi Caitlin! I entered the giveaway. I love your blog! Love your style so much! And your home – please continue with these home interior posts!! Happy Thanksgiving! Love your style! Love your style!! Happy Thanksgiving! Such a beautiful dining room! I hope I win ! I'm all about the tablescapes these days, but dang they can add up! I usually go for more gold toned hues, but I'm loving how glam the silver looks on yours above! Thank you so much for keeping your blog and pinterest fashion versatile as far as price points go! I've picked up quite a few things thanks to your pinterest fashion inspo to recreate and most of the looks are so doable! I do need to invest in some OKT boots though – the struggle for us athletic calf girls is real! Keep the style inspo coming our way! https://pin.it/yzcxcnc46ssubh I feel like my board already had tons of your posts already without even following 😂 LOVE your blog. Thanks again! And Happy Thanksgiving! your home looks so cozy! Love, love, love the tablescape- wicked cute!!! Your winter posts are my fave! Love the modern twist on your farmhouse style decor. Currently trying to transform my space to look similar. So pretty! You are so sweet to do this giveaway! I know I have pinned like a million of your outfits already, but I added a few great ones, too. Also, your Thanksgiving table is beautiful! Love your posts!! I've been following your insta/website/pinterest for a while now. You have the best style and provide so much inspiration!! I’ve been following your Pinterest for a while! Love it! Thank you for your giveaways!! Hi – thanks for doing these giveaways, it's awesome!! I justtt moved into our first house literally last weekend so this would be so nice to get! Amazing layout! Loving the diagram too! Loving the mercury glass for holidy decor! 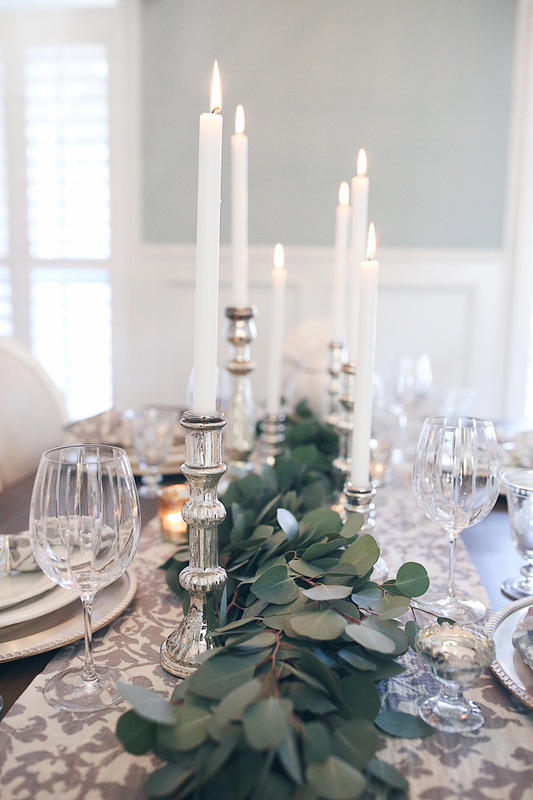 Your home is gorgeous, loving the mercury glass for holiday decor! Pottery Barn is one of my favorites – love all the mercury glass you have incorporated! Hope they are there. I am still learning all the social media ways. Love your home and style! For some reason my comment didn't appear. Hopefully this works. Love your fashion and home decor! thanks for the chance! 🙂 I love all of your posts! Love your tablescape and all of the Mercury! I always love to shop what you pin. Such cute outfits all the time! Happy Thanksgiving to you & your family! Love the tablescape! Love your posts! Especially love seeing Winston in your photos, since that’s where i live too! I am obsessed with your style, home and outfits!! I could do some serious damage with a pottery barn gift card, wrapped up in my robe on the couch 🙂 thanks for the giveaway, Caitlin! I just adore your style and decor ideas! I have been following your blog for a while and absolute admire your fashion and decor sense! I always use you as a reference guide ☺️ Thank you for always sharing! Love your table Caitlin. Such good ideas! I have followed you on Pinterest forever and love when I can take items from my closet and use them to recreate your looks! Your table scape is beautiful and so festive! I love how your house is coming out and can’t wait to see more photos!! Congratulations to you and Chris on your new house! I've been reading your blog everyday for quite sometime now but I never realized you had a pinterest! You're table looks beyond amazing btw and that rug might just be on my wishlist! I'm currently saving for my first apartment (yikes furniture/moving in general is expensive) and was so excited to hear you and Chris were getting your first home together..such a monumental moment in life! Love your table Caitlin. All your Holiday posts this season have been so, so great. I love following you on Pinterest. I usually find things I have in my closet to try and recreate looks you have put together. Thanks for doing a giveaway! I just recently moved into a new home too and can't wait to make it more homey! Just followed your Pinterest, found you on IG a couple months ago! LOVE your blog! Happy Thanksgiving! Thanks for all the style inspiration! I have followed you and Emily Gemma and you guys are my idols! My whole closest is based off of your posts! I love you and your clothes so much! Thank you for this giveaway Caitlin! I absolutely LOVE your style and cannot get enough of you!!! 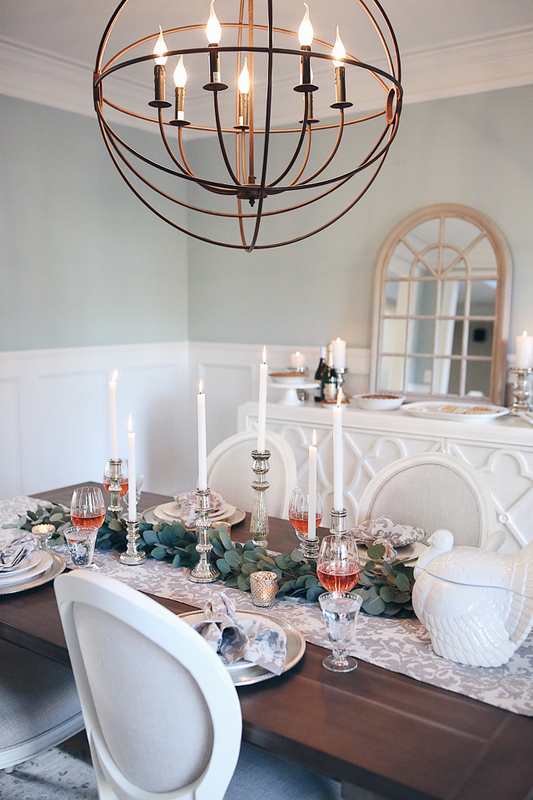 Seriously in love with your Thanksgiving tablescape and dining room! That rug is absolutely beautiful and I cannot believe what a good price you got it for! And the eucalyptus on the table is such a nice idea, I wouldn't have thought of that but it's beautiful and I bet it smells really nice too!! So many of my outfit inspos are from you! Whenever I’m home visiting my family, my mom and l will sit and go over my favorite outfits of yours. Thank you so much for the inspiration!! Obsessed with all your outfits and you have been my hair goals for years now! Love this post! Looking forward to your home decor tips in addition to more outfit posts! Here is my Board on Pinterest! Thanks for sharing! https://www.pinterest.com/kristenrbeattie/ 🙂 Pinned in "My Style"
Love your style! So glad you directed me to your pinterest because I just saw you have a post on how you curl your hair…can't wait to read it…and practice! lol My pinterest is https://www.pinterest.com/shish2/ Thanks! Beautiful table! Love the simplicity of your decorating style. Love love love mercury glass! I LOVE this Thanksgiving table! I'm feeling inspired for Thursday!! Not to mention, I really want a new sideboard and rug for my dining room, and yours might be just what I need! https://www.pinterest.com/irene20/lovely-attire/ I'd love to win this, thanks for gifting! Love the sweater in today's post too! So excited about this give away!! Seriously my favorite fashion blogger! Love your style! Love the light so much, beautiful table! I may, or may not be copying your tablescape! 🙂 Happy Thanksgiving! https://www.pinterest.com/acrainey/ Love love love your table setting! Thank you for sharing the pic of correct utinsel placement too! Love love love the set up! Love love this set up! I always love seeing your style in clothing but also home decoration/organization! Thank you for sharing it all with us. Thank you for some fantastic new ideas! Love the tablescape for Thanksgiving! https://www.pinterest.com/leblancpatti/fashion/ Thanks for the chance! Looove your Pinterest for getting cute outfit ideas! Your fashion and home decor style is perfection! I need those chairs for my dining area! https://pin.it/bw2ovkppuvyfwe Thanks for starting this giveaway! Love this! We just bought our first house and your home decor is a huge inspiration for me! Love your tablescape!! Happy Thanksgiving! So sweet of you to do a week of giveaways! You have such a genuine heart! Happy Thanksgiving! I love the colors and simplicity of the table decorations! We just bought a house too — decorating is so fun. Love your inspo! I absolutely love all of your outfits!! Absolutely love you and your style! Absolutely love you & your style! This table is so amazing!! I actually found your blog from Pinterest (looking at the Starbucks halloween costume) so loving this giveaway! This is an awesome giveaway! Always love your blog. Love all your fall outfits! All your fall/winter outfits are my ultimate favorite! Wish there was an 'add all outfits to closet' button with your posts! Loving all your home decor girl, XO. Have been following you for awhile- love your style from home to outfits and everything in between! Obsessed with your style! I would gladly pin all of the outfits you post. You have so many cute outfits its hard to pick! I had a hard time only choosing 3 lol so I pinned waaaay more than that!!! Such cute inspo! https://pin.it/4pyyiipj73emep (@Emccarthy4893) just Incase! Thanks, Caitlin! Love your content. Happy Thanksgiving! In love with your house!!! It is beyond beautiful! In love with your table decor! Oh no! I meant to post the link to the board .. it’s under “fashion sense” sorry! Love your table! Makes me want host a dinner party!! Your tablescape is beautiful! I just purchased a home this year as well 🙂 Happy Thanksgiving! May God continue to shower you with His richest blessings! Happy Thanksgiving to you and yours. May God continue to shower you with His richest blessings! Happy Thanksgiving! Love this tablescape so much! Perfect Christmas gifts included in this giveaway! This table set up is beautiful!!! Just got a new place and am trying to find nice items to fill it with! This post has given me a lot of ideas! Love your Holiday inspiration this year! I have literally been obsessing over finding new dishware for a week and half and have been having the hardest time finding ones that I love! Love your set! I’ve been following you on pinterest already for a long time! My board with your pins! I could pin every outfit you wear! I love them all!!! 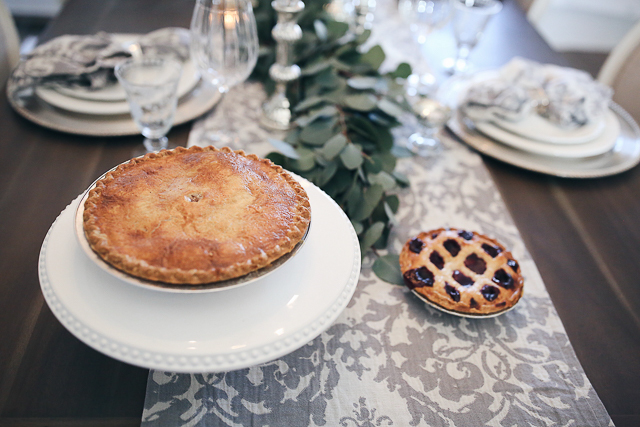 I love the tablescape and the pies look delicious! I have been lusting after this robe a d the candles for oh so long! Your home and style is wonderful per usual! Please! I have been lusting after this robe and those candles for oh so long! Your home and style is wonderful per usual! Hi! So sweet of you to do this giveaway. I love your style and enjoyed seeing this tablescape post too. I can always use some home decor inspo! Reading your posts each day are the highlights of my day! Thank you for all you share!! Love the formal table diagram!! Love the formal table diagram! Thank you so much for offering these generous giveaways! 🙂 Have a great Thanksgiving! Thank you so much for your generous giveaways!! I'm a huge fan of this blog 🙂 have a wonderful Thanksgiving!! Love your blog! �� Happy Thanksgiving to you & your family. Follow and Re – Pinned! Love seeing the pictures of your new home! Looking forward to an office post! Omg how perfect!! Love the blog! You’re seriously so great! Thank you for thinking of us!! I love your home decor!! Hope you have a wonderful Thanksgiving! I've followed you on Pinterest for awhile and pretty sure that's where I discovered your blog. Love the content you produce! I just moved into a new home so this was be fantastic! You have such a classy style, in decor and clothes. What an exciting week! Thanks for the chance to win! I love you’re blog and your style! Such fantastic taste. And so beautiful! Here is the link to my board! Happy a thanksgiving!! i want to come to thanksgiving at your house! Love your blog! Thank you so much for this giveaway!! http://pinterest.com/jessicakeyes don’t know how you look so cute all the time! Then to see how adorable your house is….wow! don’t know how you look so cute all the time! Then to see how adorable your house is…wow! So chic! Love the rug! Love love love your blog!! Your home looks beautiful! You've done an amazing job of decorating your home and Thanksgiving table! Love love love your blog! Your home looks beautiful!! Loved your thanksgiving blog post! Hosting Thanksgiving this year as well! Love your table settings! Heading to Pottery Barn fornsome last minute shopping. Thanks for the inspo! Have always loved your style and I’m so excited we get a peak into your home life too!! Happy Thanksgiving! 🙂 So many beautiful photos in this post! Thank you for the Thanksgiving table theme post. 🙂 Super helpful! I have been following you for awhile and you always post the cutest and classiest outfits. Always pin your outfits! Love it! Yay you picked the robe to giveaway!! I’m so excited you decided to giveaway the robe!!! Love your insta and blog! Love your insta and blog!! Love your blog! I have been following your Pinterest for quite some time now. Have been using your pins for some inspiration, as my family just bought a new house and gutted essentially the whole place. I designed the whole thing (to be finished though…). Love love love that sideboard! Obsessed with everything. Looks amazing. Yay! Now I know what I'm doing over Thanksgiving Break…creeping on all of your Pinterest boards! Love your style; thanks for sharing! Happy Thanksgiving! Thanks for hosting this give away! Hey Caitlin! I love how you’re decorating your space. I’m in my own process of doing the same, to my first apartment with my boyfriend. I found your blog in Pinterest a while back and you are literally my life goals. Congrats on your engagement! I pinned them to my style board, which I linked! You are a fashion inspiration! Love your style! Your home is beautiful! Happy Thanksgiving! PS. Quick plug for more wedding updates 🙂 I'm engaged and having the hardest time finding white dresses – that I love – for all the festivities leading up to the big day! Happy thanksgiving! Excited for this giveaway! I did the math! This entire room costs $8,209!!! I can't wait to decorate my house! https://www.pinterest.com/marleejwilson/ I love your blog!!! I'm so inspired by your outfits and style! Your home is amazing. Happy Thanksgiving!